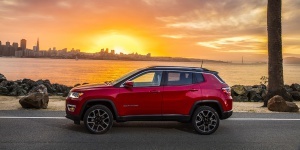 For 2019, the Jeep Compass features two new option packages, while Sport and Latitude models come standard with a 7-inch Uconnect audio system. The Upland special edition brings Trailhawk looks to Sport models. The High Altitude Appearance Package adds 19-inch wheels, 8.4-inch Uconnect infotainment center with navigation, LED tail lamps and HID headlamps with signature LED light, deep-tinted glass, as well as unique exterior and interior applications to Limited models. The Advanced Safety Group Package now includes adaptive cruise control. Get the best price for the Jeep Compass of your choice from a dealer in your area. Request a price quote now.